Hi! My name is Ms. Sasha and I will be your child’s teacher for this upcoming school year. I cannot wait to help your child learn and blossom. 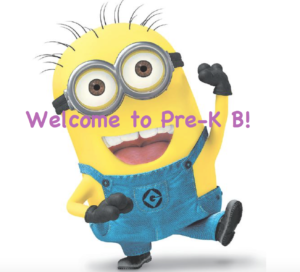 Pre-K B will also have Mrs. Janine and Mrs. Rosa who are also very excited to meet you all! We decided to use our classroom door as our backdrop for our photo. We all had to find spots to squeeze into =). 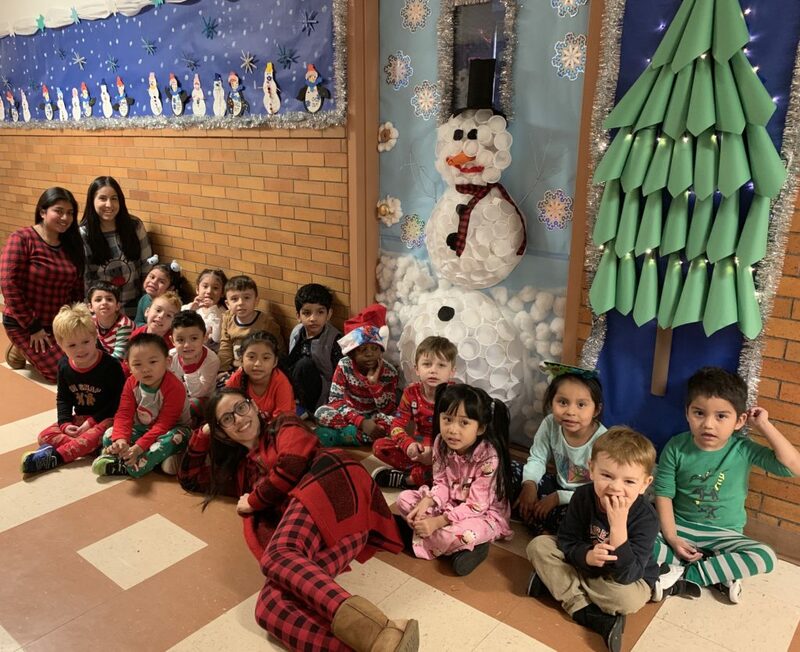 We absolutely loved all of our students pajamas! Here is a recap of Pre-K B third unit of study, All About Us. Children were able to explore more about themselves. We learned more about who we are and who are the people in our lives. Below you will see photos of the students work as well as other AMAZING events that happened throughout the month of November. MATH:After discussing measurements, students had to guess how tall they are and then see how tall they really are using our hands. This will be revisited at the end of the school year to see if the students had grown! MATH: Children were invited to refer to their name cards and count the number of letters in their names, then place the appropriate number card next to the name card. Children can count the letters in their own names as well as their peers’ name. Then students were provided a sheet with their names and the number of letters they have in their names. Students used their fine motor skills to trace the numbers as well as writing their names. LITERACY: Students listen to a read aloud of Knuffle Bunny by Mo Willems. After reading, children were invited to share something that they like or that is very important to them and why. Children were then invited to record their ideas through their own writing, drawing a picture or dictation. LITERACY: After reading Friendshape, students drew a picture of their friend and discuss why that person is their friend. Students used different shapes to create their best friends. WRITING: Teachers pre-wrote each child’s name in glue on a strip of paper. After the glue was dry children were invited to use crayons to create a name rubbing in the same way they did sandpaper rubbings in Unit 2: My Five Senses. ART: Children were invited to observe their faces in a mirror. Teachers provided paper, writing utensils, and various size shapes from construction paper for them to draw and paste what they see as well as using shapes to create their bodies. Children were encouraged to look carefully at their faces and consider how to illustrate the features and details they see. After gluing the shapes together children were able to use writing utensils to add additional details (hair, patterns on clothes, etc.). ART: Teachers cut paper plates in half. The children were given half of a plate and were invited to draw a mouth on the plate expressing an emotion (i.e. a smile for happy, frown for sad). Children taped a Popsicle stick to the bottom of the plate for them to hold and were provided a mirror for the children to use as they hold the emotion mask over their own mouths. Children were invited to try to make their eyes match the expressions on the plates as well. SCIENCE: Children were provided the outlines of faces as well as playdough. They were invited to use the dough to create facial features for the faces. Students used glue to attach their dough facial features on their paper faces. SCIENCE: Using an ink pad and/or a marker, children were able to create their finger prints. Teachers discussed fingerprints with each student. Children were invited to use a magnifying glass to compare and contrast them. THANKSGIVING CELEBRATION! THANK YOU TO OUR PARENTS FOR THE DELICIOUS FOODS!